Let’s partner. You market, we sell. Whether you own your own company, agency, are a web developer or a small business consultant, we’re here to make sure your clients are aware of how TPS Services can help their businesses grow compliantly. As a TPS Services Referral Partner, our goal is to empower you to offer TPS, CTPS, FPS and MPS screening to your clients in addition to other Services offered by TPS Services. We’ll not only help you evaluate whether TPS Services is the right solution for your client’s needs, but we’ll also work with you as a true partner to support you every step of the way during the sales process. Once you’ve generated a qualified lead, we’ll take it from there answering questions, providing information and helping convert your leads into TPS Services customers. Here is an example of the possible annual referral fees payable on someone referring 23 small clients across one year. 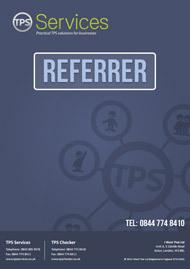 This is our standard Referrer agreement. Please feel free to download it.